Since I don’t have any pictures or anything yet, I will start this blog by speaking of my crafty history. When I was but a wee Stitchy, my mother loved to knit and crochet. She tells me about the beautiful coats and sweaters she made for herself when she was single, but what I remember are all the afghans. We always had plenty to go around – we rolled around on them, used them as capes, and made forts out of them. I remember my brother and I trudging home from school on cold days and being greeted at the door with afghans fresh out of the dryer. There’s nothing better than being wrapped in a huge pile of warm yarn after a miserable walk even if it is acrylic. And so began my love of handcrafted stuff. I say “stuff” because I didn’t learn to crochet or knit until way later. My first obsession was embroidery, which my mother also enjoyed. My specialty was cute little animals. I even did a raccoon with a huge fluffy tail which required a fair bit of technique for a kid. I recently found a few of my masterpieces, and much to my husband’s dismay, hung them. In my early teens, I specialized in making earrings out of random things (fishing lures, puzzle pieces, Monopoly houses . . .). Because I grow sentimentally attached to everything short of dust bunnies, I still have those as well. Again, my husband smiled as politely as he could and was secretly relieved that I didn’t try to display them. For the record, I still have my headgear and a stack of teeny-bopper magazines from the 80’s with every single picture of Duran Duran cut out. In high school and college, my new obsession was photography. I eventually realized that I much preferred working in the darkroom to actually taking pictures. I finally realized that I just like using my hands. I wasn’t trying to make any statements, which is why Art School was just not for me. So I moved on and got back into handcrafts. I spent a while making Scupley figures for friends and those were really fun. I’ll probably get back into doing that eventually. 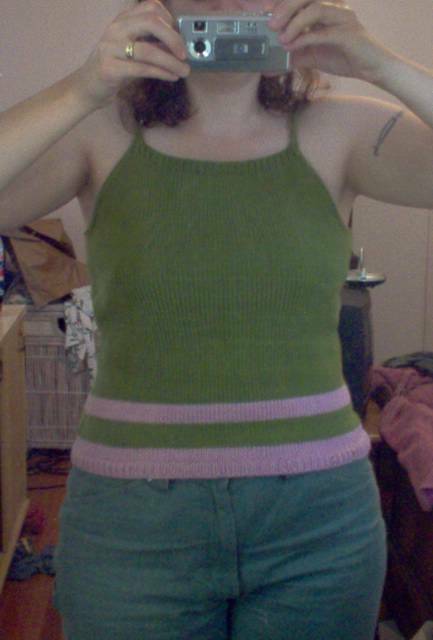 A few years after college, my friend’s mother taught me how to crochet. And that was when I new I found something I could really sink my teeth into. My first attempt at crocheting an afghan had inexplicable results. After what was probably weeks of crocheting, my roommate asked just when the hell it was going to be done. Dumbfounded, I looked up from my work, legs baking under the huge mound of crocheted fabric, and said, very plainly, “I dunno.” Now let’s just get the record straight. This was a period on my life when I was smoking a fair amount of weed and it just hadn’t occurred to me to stop crocheting. So I stood up and lifted the afghan. A load of fabric hit the floor with a soft thud. I raised my arms above my head and there was still a large amount of yardage lying in a heap. Just how long was this thing? My roommates and I spread it out along the floor. The person who took the far end seemed to walk for quite a while until he ran out of afghan. With tears of laughter in our eyes, we measured the unruly beast. It was 3’ wide and 28’ long. I eventually cut it into pieces, tied the ends off and crocheted the pieces back together for a more respectable 14’x6’ blanket. Unfortunately, I wasn’t very good at my newfound craft so the stitches were very loose and it didn’t take to the washing machine very well. It eventually kind of decomposed back into a pile of yarn, but my friend’s cat used it as a bed for years. I did finally get the hang of it and branched out into filet crochet, a more delicate type of work using thin cotton. But the clothes you can make using crochet left me ice cold (and usually laughing). I just didn’t like the look of it. So after making countless afghans and doilies and lacey trim, I’ve moved on to knitting! I still dabble in embroidery and crochet, but knitting is really where it’s at. I’ve made many scarves, a couple of felted handbags, and just completed my first wearble thing a ChicKami from ChicKnits! Eventually I will put up a gallery, but I just wanted to get things rolling. I promise future entries will not be as long, but I was feeling long-winded. This is my brand new toy. A knitting blog, because knitting wasn’t taking up ALL of my spare time. Here is where I plan to keep track of my knitting and crocheting projects.